Highest level of education: She finished university at 14! I really liked this biografy about Asuka, because is so complete, I´m not going to change anything just as a sign of respect. I take it from THE SOURYU ASUKA LANGLEY TEMPLE. "Asuka Langley Souryu was born on December fourth, the year 2000. She was 3/4 German and 1/4 Japanese. Her mother, Souryu Kyoko Zepplin, and father were both scientists. When she was quite young her parents divorced one another and her father married soon afterward, to another scientist. Asuka was left with her mother, who was driven insane when the attempt to synchronize with an Evangelion Unit left her emotionally tormented. She began to treat a ragdollas though it were Asuka, devoting her time to the doll rather than Asuka in part out of guilt over the times she had chosen work over her daughter. Asuka was forced to mature quickly. She forced her emotions, save for a few negative ones, to the back and began to act like an adult despite being very young. The day Asuka learned she was to be an Evangelion pilot as the Second Children, she ran to tell her mother. When she reached her, she saw her mother hanging from the ceiling. She had killed herself. Before she died, she had ripped the head off the doll she carried. As Asuka later observed, she looked peaceful and happy in death. Asuka went to live with her father and stepmother, but she and her stepmother could not treat one another as mother and daughter. Her stepmother found Asuka's behavior to be eerily adult, and refused to act as her mother. Her father was unable to help them reconcile. Because of all the times he had not been present in Asuka's life, she was not fond of him, either. She also did not want to be treated as a child; she'd spent too much time as an imitiation of an adult. Asuka became the Evangelion pilot as scheduled. She lived in the U.S. for awhile, where she met Kaji Ryouji, Misato Katsuragi's ex-lover. Asuka developed a crush on Kaji, who was over twice her age. When she was finally introduced to Misato and Shinji, the Third Children, she belittled Shinji and felt as though Misato were a rival of some sort. Asuka also had the habit of reminding everyone that her Evangelion was the first "real" Evangelion and that she was the best pilot. She did indeed have the best synchronization rate when she first joined Shinji and Rei, too. Once in Japan, Asuka was brought into Misato's apartment to live with her and Shinji. She soon met Rei Ayanami, the First Children, and was immediately unable to befriend Rei because Rei was indifferent to her presence. 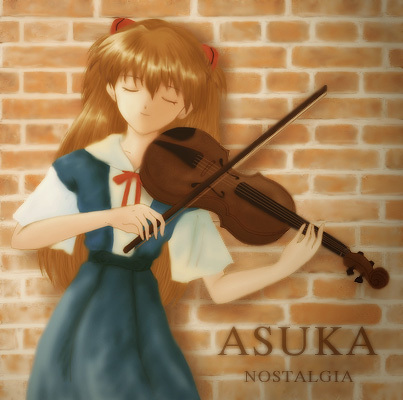 Rei also reminded Asuka of a doll, passive and emotionally bland, as though she were not a real person. She despised dolls due to her childhood traumas with her mother and at times was no less than physically violent toward Rei. Asuka's mental decline truly began when she was constantly being bested by Shinji. His synchronization ratio was better than hers, he was superior at combat, and he saved her several times. When this became well nigh a tradition, Asuka was angry. Yet when her Eva literally lost its head in combat, she went downhill quickly. The emotional damage done unto her was irrepairable. She hated Shinji for being the best and she hated Rei for accepting it in her dispassionate manner. What finally broke Asuka was when the fifteenth Shito (Angel) broke into her mind and brought up the painful memories from her childhood, including all those of her mother. Asuka did not want to remember those things but the Shito raped her mind, forcing her to relive the deepest suffering of her life. When she was finally released it was because Rei threw the Lance of Longinus through the Angel, destroying it and thus ending its hold on Asuka. Shinji went to Asuka to comfort her but she refused to say anything to him except that she hated him and everyone else, especially Rei. Soon Asuka entirely lost her ability to pilot the Evangelion. Her mental instability was overwhelming and she became practically despondent. She briefly stayed with Hikari, her friend from school, but eventually wandered off into the decrepit Tokyo-3, evidently intending to die. She was found naked in a bathtub at an abandoned building. It was then that Asuka was officially replaced with the Fifth Children, Kaworu Nagisa. That is Asuka's life as given by the television series. It also extends into the movies, obviously. The twenty-fifth episode was originally supposed to be much akin to End of Evangelion, the third movie made for the series. In End of Evangelion, Asuka was in a semi-comatose state until about the time that Evangelion Units 5-13 attacked Nerv par Seele's orders. Asuka regained consciousness and the ability to synchronize with her Evangelion once more. She battled the other Evangelions, but in the end she could not truly win. As the movie ends, she and Shinji are the last human beings on the planet, all the others having merged with Rei and Lilith to take part in the Third Impact. Asuka's last words were "I feel sick." It is implied in the ending that there is a relationship between Asuka and Shinji which parallels Adam and Eve. They are the only humans left. However, it is also possible that the entire sequence was in Shinji's mind, his vision of how things should end. Perhaps both he and Asuka died defending Nerv, but in Shinji's "heaven" they were together. The scene is left open to interpretation. So, what do you think? This is what I call a biografy!